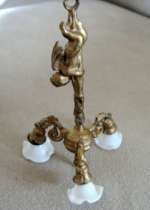 12 cm Lovely Golden Chandelier with Putti. Bristol glass shades. Germany ca 1880. Lovely dollhouse accessory. 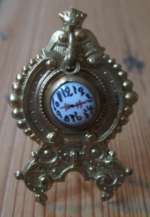 1 1/2"(4 cm) high is this rare Ormolu pocket watch on holder. Victorian ca 1880. You can take the watch from the holder.The watch face is enemal, the back is ormolu with a nice pattern. Perfeckt bright condition all over! Lovely for the gentlemans nighttable for his pocket watch! 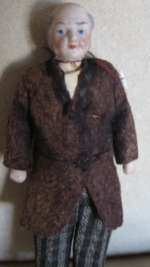 Grandfather dollhouse doll-Wonderful detailed molded old man with character face-dressed in housecoat and striped trousers. Wonderful original condition all over. 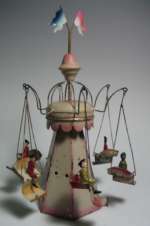 Germany 1890Size 12 cm / 4 3/4"
Frühes aufziehbares Karussell, hergestellt von Doll, Deutschland. &#8232;Frühes Karussell, hergestellt ca. 1910 von der deutschen Firma Doll. Aufziehbar, in wunderschönen Farben. Wenn es aufgezogen wird, dreht es sich und es erklingt eine „Pling-Plong“-Melodie. Handgemalter Schriftzug „Merry-go-round“. Wunderschöne Kinderfiguren. Sehr schönes frühes Blechspielzeug in sehr gutem Zustand. Höhe: 35,5 cm. 10 cm/4"H is this classical Ford made by Bing Germany. A very good tin plate car in an excellent condition. Clockwork. And with a lady driver! Ca 1920. Antique Bisque Kestner character doll mold 260. 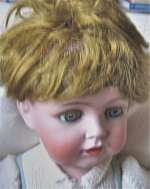 This antique Kestner character doll has the mold # 260. 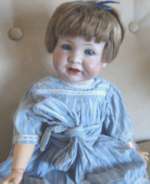 A lovely babydoll with excellent bisque on the original kestner body with the left arm bent.Original auburn wig, lovely sleep eyes- dressed in baby outfit. He is stamped on his head and on the body too. This lovely doll comes from a private estate.Size 60 cm. ( 23, 5") A fine doll for your collection of character dolls. This is a rare and outstanding character doll from Kämmer & Rheinhardt mold 116a. ca 1910. Her bisque is flawless, lovely face, that you cannot resist.Open/closed mouth.She has her original auburn wig, lovely blue eyes, dimples. She is on her original ball-jointet Kämmer and Rheinhardt body, which is in extraordinary good quality. She wears her original cotton dress, underwear and shoes-and even comes with a wardrobe: a lovely white laze dress, a coat, a hat, underwear, and a nightgown. She is from a private estate-and comes in a box, that the owners kept her in sinece their childhood.